it—its symptoms, how it’s transmitted, how to reduce your chances of getting it, and how to manage the condition if you do get sick. If you’re like 95% of American adults, you had chickenpox in childhood. Before the United States started its widespread vaccination program in 1995, there were roughly four million cases of chickenpox every year. Contracting the highly contagious virus, with the itchy, whole-body rash that it causes, was virtually a rite of passage for many American children. Chickenpox, which is caused by the varicella-zoster virus, has no cure. But unlike viruses that your immune system clears from the body within a few days or weeks, the varicella-zoster virus doesn’t leave your body. After your symptoms go away, the virus hangs around, taking up residence and lying dormant in your nerves, with your immune system holding it in check. But later—often decades from the time it first made you sick—varicella-zoster can suddenly emerge and hit you again, this time appearing as a different condition known as shingles. Like chickenpox, shingles also causes a blistering rash, but this time it generally appears as a painful band around one side of your ribcage, or it may appear on one side of your face. The first symptom for many people is pain or a burning sensation in the affected area. You may also have fever, a headache, and fatigue. Along with the rash and other temporary symptoms, shingles can also bring unpleasant, long-lasting, and sometimes permanent complications such as skin infections, nerve pain in the area where the rash appeared, or even vision loss. Some recent research even hints that people who get shingles also may be temporarily at higher risk for heart attack and stroke. Anyone who develops shingles can develop complications, although such problems are more likely to occur in individuals with a weakened immune system. 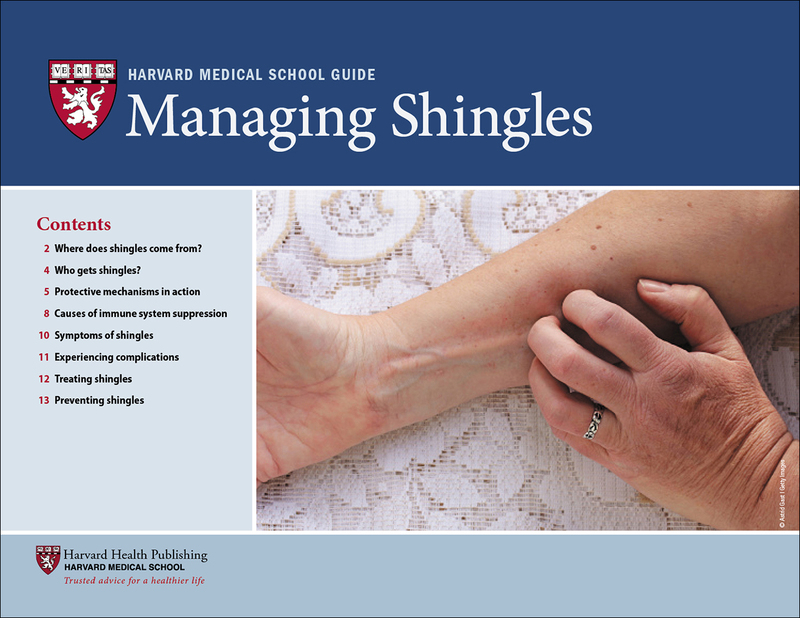 Complications are less likely to occur or tend to be less severe in people who have been vaccinated for shingles and people who receive prompt treatment with antiviral medication during a shingles attack. Damage to hearing or balance. When the shingles virus affects a facial nerve close to the ear, you can develop a condition called Ramsay Hunt syndrome. This condition can cause ear pain, ringing in the ear, vertigo, hearing loss, and sometimes facial paralysis. Heart attack and stroke. Some studies suggest that shingles may increase the likelihood of having a heart attack or stroke for a period of time after a shingles attack. Research reported in 2017 in the Journal of the American College of Cardiology found that this risk was highest during the first year after the onset of shingles, and then diminished over time. However, more research is needed to confirm this connection.